This page includes a file of our older updates for reference. Please see our Current Updates page for news! We want to wish you all a very happy Holiday Season! We also would like to thank all of our great customers! Without you we wouldn&apos;t be here. We really do appreciate your patronage. Our very best to you and yours, which includes your tanks and inhabitants. During this time of year, shipping is not usually a problem until the last few days before Christmas, but supply sometimes can be. Many of the suppliers close for a week or two just to avoid the whole thing, usually from Christmas into the first week of the New Year. Some will stay open and ship right through it though. Of course we watch the weather like a hawk this time of year so we know how much to heat pack, where. Fiji Pukani live rock is coming in fantastic. Check out the couple of pics Terry L. from Phoenix just sent us. It is the real deal lagoon-to-you fresh live rock. Terry has had every kind they ever made (LOL) and is what I would call a expert level connoisseur of live rock. There are fancy Acro shipments, monthly or so, from Bali usually either the Premium or the &apos;X&apos; folks ship, one or the other. Kupang has been good and consistent for mixed coral boxes, and their cultured Acros are great. Fiji has been outstanding as always for wild Acros and mixed boxes of corals or fish. The Bali and Philippines tranship fish are coming in great too. These are the highest quality suppliers. Just send an e-mail and let us know what you want or are interested in, or call, and we will direct you to the best place to get it. The .pdf pages are updated monthly or more and you can always get a good idea of what is to be had with whatever is up. Note that the .pdf pages are often updated and changed, so if you wish to bookmark, please make sure it's the main .pdf index list (link below) and not the individual .pdf pages. Meanwhile, have safe and happy holidays! Check out the new photos of some of the current Fiji Pukani live rock coming in. There are some large pieces that look great. The regular is awesome too. Fiji corals and fish are always world class A grade. We will soon have cured live rock available in smaller quantities than the 44 lbs. box. The system is nearing ready and should be "rocking" in a month. That floor was way more uneven than it looked. So for those with smaller tanks, or if looking for just a piece or two or few, we will soon be able to help you with small quantities of cured live rock. For beautiful assorted wild Acro colonies, Fiji is the place. For zoas and shroom rocks, the Viet Nam boxes are best. 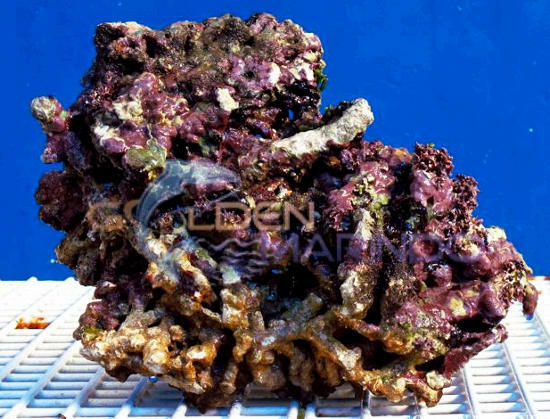 For mixed boxes of corals, Fiji and Kupang are both great, check to see which what you are looking for. When Bali-C does (cultured) Acros, they are worth getting too. For fish, it is mostly a matter of which place has what you want. All of our sources are of the highest quality available. There are cheaper guys at every source. We think these are the best. Remember the lists barely change and you can order off a two or six month old list and get a 98% fill rate. Some don&apos;t update their stock numbers, they are just an average of what to expect or not, to give an idea of what there is a lot of and little of. Just so you know if you just want a box of items they have one each of, it probably will not happen. Keep an eye out on weekly list updates: There are occasional Vanuatu fish shipments coming in, the LAX Greenhouse List will have them for a week or two until gone. They have a bunch of great stuff you don&apos;t see from other sources. See the recent Vanuatu list on our .pdf lists page for an idea of what they have now. We apologize to our customers with e-mail accounts at live, hotmail, and msn. We cannot currently (for the last week) send you an e-mail without it being returned to us undelivered. We can receive from you, but are unable to send to you. So please call, or send us a message from another e-mail account, if possible, until this issue is resolved. The MS e-mail system apparently has our ISP&apos;s server blocked for some unexplained reason (it wasn't us) ... no problems with yahoo or gmail, it&apos;s only a MS e-mail system based issue. We hope summer fun is finding you! Remember if you are near water to look for fish. Guess I didn&apos;t need to say that to y&apos;all. There is a new page of photos that our wonderful customers have sent us in the last few months. There are some amazing looking reefs, and some outstanding corals. Check it out! A bit heavy on the Acropora, that's how those goes. Lots of corals are coming in great, Fiji and Kupang are the two most consistent, regular, dependable nowadays. Viet Nam is fantastic for soft corals, if you like shrooms and zoas. Between those three you can get most of what you need. 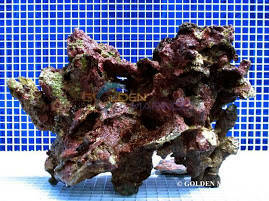 See our Corals List Central page or the .pdf pages to see where has what. The super rare high dollar stuff is more irregular and you just have to be ready waiting to throw money at them when they announce. They are all very limited and are nearly sold out when they announce. This is how it is with Taiwan Zoas, Australia, Premium or X Acros, etc., all the specialty sources. Lots of great fish are available from Philippines (some Gem Tangs recently!) and Bali, and the I.O. fish from Kenya and Sri Lanka are outstanding. Keep an eye on the .pdf pages as those are updated monthly; although if you have a list from a few years ago you'll see 95%+ of it is identical. The LAX Greenhouse List usually has a little bit of Sri Lanka, Kenya, and often some Vanuatu fish on it, with tanked pricing in LA. If you want a weekly Excel file updated set of lists, just send an e-mail, we'll put you on the list. If you ever have trouble calling, try the 855 toll free #, some callers have trouble getting through at the 866 #. There is a hiccup with Indonesia coral availabilities, as last years&apos; quotas, used or not, expired on March 31st. Currently, there aren&apos;t any CITES permits for coral export from Bali, Kupang, Indonesia (Jakarta), and all the assorted smaller places in that area. There is no word so far on when the new quotas and permits will be issued and we can only wait to hear something and it&apos;s all off-line for now. Until something breaks, some are trying to get permits for the fancy cultured Acropora. We had expected a list of choices from one of the sources this week, but nothing yet, so we&apos;re not sure if that will happen. Don&apos;t get me started on how we can&apos;t get permits for aquacultured products under the current system, which is utterly ridiculous! Fortunately, this affects the Indo quadrant only. This means that Viet Nam, Australia, Fiji, and Tonga are all fine. Speaking of Tonga, we will have a new Tonga list out again shortly, which should help fill the void. They have a limited list, but their corals are great. There are some Vanuatu fish coming into the greenhouse again now, as well as some Kenya, so you might want to see what is in the greenhouse! Here is a note we received today (Apr. 6) about the Fiji Pukani live rock that went through yesterday. "Everything went without a hitch. Finished up rinsing and placing rock in the tank and all I can say is &apos;WOW&apos; and thank you. That is the &apos;GOOD STUFF&apos; for sure. I could hear the life soaking back into the rock not to mention what I saw. Keep up the good work. ;) Thank you David M. in Mass.!" If you want regular weekly updates ask to get on the mailing list. Meanwhile we hope that spring is finding you! Update on Australia corals ... there is a shipment scheduled for arrival on March 28th. Updated Note: There has been a delay with Australia corals, partly due to Cyclone Debbie. We hope you are having a happy New Year! It is off to the races, we are already over half way through the new month! Did you see that Ruby Sea Dragon at our Facebook page link or on our Links page? What an awesome animal! Semi-prehensile tail, sorta like horsies!?! In our view of sea dragons, it is a game changer. There are lots of different things coming in, but many of the shall we say non-standard basic places are a bit less regular than the clockwork of Philippines or Bali fish. So you have to be patient sometimes. There will be some fancy Bali Acros shortly. Australia is shipping (Wed. 18th) again, there is a wee bit of Red Sea via Sri Lanka, there will probably be some clams and Tonga again shortly. Keep your eyes on the weekly excel file update (send an e-mail if you wish to receive it automatically) for the latest weekly shipping news. At the risk of being redundant ... here is a note we just received about a box of Fiji liverock shipped last week: I am not kidding when I say it is the real deal old-school Fiji live rock. We wish you all happy holidays! Our very best to you and yours! We thank you very much for your support, and are honored to serve you. Be safe, stay warm, have fun, get plenty of turkey, ham, and nog! There may be some hiccups with shipping the next two weekends with the holidays falling on Sundays. Some may ship for during the week arrivals, like for Tuesday or Thursday. One we just found out about is the fancy Bali X-Acros. They will be shipping for Thursday the 29th to LAX, Friday the 30th to you. We will be sending a list out with the contents of the two box options you get to choose between today. Ask if you want to see contents lists and you aren't on our mailing list. Fiji just had a major rain event with flooding ( in case you don't have the "Fiji Times" bookmarked like birdfish ), so they couldn't ship this past Monday as they usually do. We are waiting to hear when they will be able to ship. In case we don't talk before then, have a very Merry Christmas, a Happy Hanukkah, Kwanza, Winter Solstice, Festivus, and have a healthy and Happy New Year! Thank you all very much for everything! Hope you all got enough Turkeyfish! Bali-C cultured are up and running again, with species picks, and often even color selections. They are ON for this Sunday to LAX, but orders have to be in by Wednesday, Nov. 30th. Please ask if you want a list. You can order assorted, but picks are available and most of the places quit doing that. Then there are two of the super fancy high-end cultured Acro sources in Bali worth doing. Both ship irregularly and with little notice, so you have to be ready to jump when they announce. We often only get a couple of days notice and there are only a few boxes available. They make assortments up for each shipment and send a list of what will be in the A or B box. You get to choose which, yes or no ... (no cherry picking). Here is one of the recent offerings from the "X" place at the link below so you can see what types they deal with. It is top of the line A-to-Ultra Grade and better, world class stuff. Send an email to get on the updates list so you will be notified when it is "ON". Hope fall is finding you and your tanks well! Mainly we want to offer a friendly reminder that the weekend of Thanskgiving (Sunday the 27th) can be rough for shipping out of LAX. So many travelers are going home that Sunday night that shipments can get bumped off the "red-eye" flights. Mostly it's flights to the big major cities that are affected. Often, if you are at a destination with a morning flight on Southwest, there is not an issue, although some major destinations (larger cities) can be. The first three weekends in November, however, are not a problem. Think ahead and plan early for the holidays! There are great corals coming in from Viet Nam, Fiji, and Jakarta, weekly. With some of the high-end things like Australia or Premium Acros or Zoas, you have to be ready and waiting as we often only get a couple days notice. If you want to be notified when they are "ON", just send a note asking. Kenya, Sri Lanka, and Fiji all have World Class A-1 fish coming in too. Have a Happy Thanksgiving, Turkeyfish! We hope you had a great summer! The heat is fading, finally. Below is a note from a customer about the Premium Acropora that come in from time to time. These and the &apos;X&apos; Acros are both great. If I said all this you would think I was seriously over-selling...LOL. They ship every month or so when they feel like it or run out of coconuts and clams. You have to be ready to jump though, we get about a day&apos;s notice to get orders in and it is sold out. 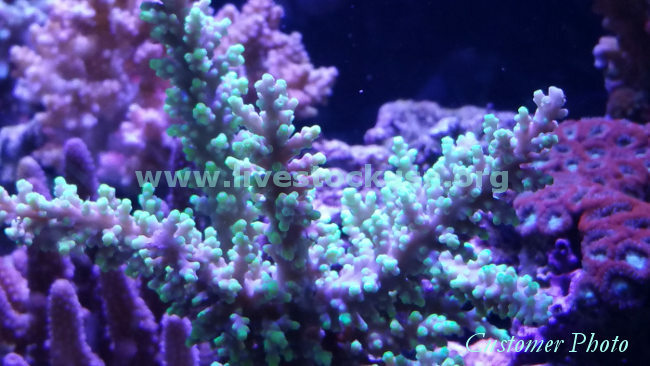 There are some more expensive Australian Acropora available from time to time as well if the X or Premium Acros aren&apos;t high enough priced for you. They are coming next Tuesday the 20th of Sept., about 10-11 to a box for $140 each piece. Some are whole colonies, some are the big broken branches. Ask for a link to see the pics of them. You can also call or e-mail us to ask to get an Excel file with a bunch of current updated lists from many different sources. Remember if you have trouble with the 866 toll-free (mostly Sprint users), use our other toll-free 855 (cell) number. "You guys do amazing things. That box was beautiful ... even the packaging was pretty ... every knot perfect ... and the pieces ... well, these guys named themselves appropriately. They're in the tank for an hour and we&apos;re already getting some polyps sneaking their little heads out. Now I wish I had gotten A AND B ... silly me for being responsible ... or something ... you tell these guys they&apos;re awesome for me next time you speak with them. You have a good evening too sir ... ya'll made my day!" "The lights went out, so it&apos;s too dark to tell who&apos;s who at this point ... but they didn&apos;t send me box A according to the packing sticker. They appear to have sent everything I wanted from both lists, and left out the ones from list A that were less exciting to me. Almost like they could read my mind ... I mean sure ... there&apos;s no purple Caroliniana, but there&apos;s a mystery valida and abrolhosensis ... and I always fancied a valida ... on neither list, but on the sticker ... maybe it's in the tank. I can't wait to play detective in the morning. 20 of the 22 pieces were also bigger than expected ... 4 or 5 of them were at least double what I expected. The one Monti was as expected ... the other (undata) is way cooler than I thought (my brother thought it was an acro cuz of how its growing) the other "little" guy might be the valida, cuz it's awesome looking, even if dwarfed by his friends ... the only piece that broke a bit was still bigger than expected even after fragging itself twice en route. Very satisfied customer here ... I had to tell you twice, and usually I just keep my mouth shut and smile when I'm happy. I'll be sure to tell anyone who asks where they came from. Keep doing what yer doing, it's good. I forgot the best part of the story was my brother at the unboxing ... as we're opening it up he says to me, &apos;so how much did you pay for this one box?&apos; And gets a little bit of the eyebrow raise going on like I was crazy ... then he sees the bagging job and compliments it ... something about he's been tying bags for 15 years and these guys know what they're doing ... then as he cuts open the first bag for me it immediately turned to &apos;holy %^#! bro&apos; ... I think he musta said it 20 of 22 times ... the only other was &apos;what's this?&apos; (Monti) and &apos;this one's broken, but still huge&apos; ... by the end of it he was very impressed and he&apos;s not an easy one to win over. Big time kudos"
We're happy to share a handful of photos shared by a couple of our recent customers! see .pdf page shown on our Red Sea page! First we want to wish you all a Happy Independence Day! We hope you have a great Fourth of July! What a great holiday ... picnics, barbeque, maybe something near some water (keep an eye out for fish!)... stay safe, hydrated, and have fun! Second we apologize for being too busy to keep this page as current as we wished we could. Ask for an Excel file with the most recently updated set of lists anytime. Most of our .pdf pages of those same lists are regularly updated; most of the lists usually stay the same. Just check to see if what you want is ON, or for the most recent update. Due to the holiday, a few things are coming in on Monday this coming week instead of the usual Sunday. Such as Viet Nam and Bali Blue. Also, if not too many of you do it, we can have a box tanked overnight in the greenhouse if you want something that is coming in on Sunday if you won't be around Monday to receive it. We'll ship it out on Monday for Tuesday arrival to you. Remember if the 866 toll-free doesn't connect (hardwired land line), try the other toll-free 855 (cell) number. 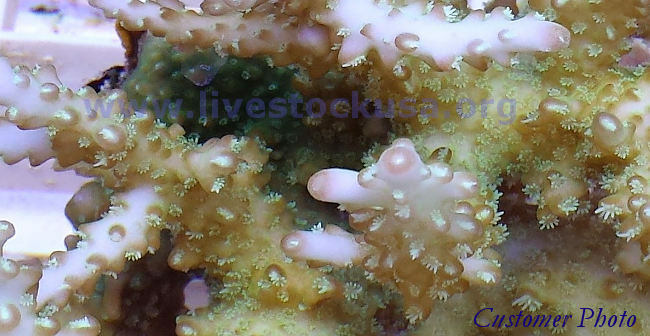 Check out these premium acropora! 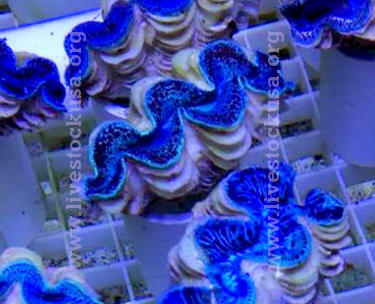 Discusses some examples of what you may expect when corals arrive. There is also another new page with pics of some of the super-fancy Taiwan Zoas which are a once every couple of months or so thing. You have to be ready as we only get a week&apos;s notice when they are coming. Fiji Acros have been fantastic as usual, and the air-freighted real deal live rock is great! 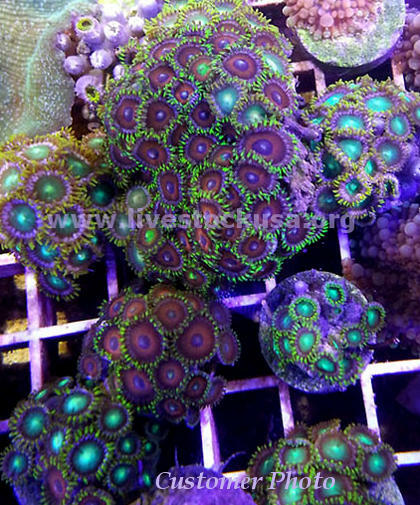 The Viet Nam zoas, shrooms, and softies have been outstanding as always too. For fish, you can&apos;t go wrong with Kenya, they are great I.O. fish. There have lately been, every couple of weeks or so, Sumatra fish, and it is very good too. Fiji is always all hand and net-caught as well and also excellent quality fish. Here are some recent customer comments to share with you! "The two blueline angels are awesome ... Thank you so much for your expert service!" "We got the live rock; it's in the tank. BEAUTIFUL. Thank you; I will surely contact you when I'm ready to add corals!! It looks beautiful; lots of orange & purple on it. Some soft stuff sponges I guess and one little crab was still moving. One little clam didn't close up so in the trash; another one closed tightly; he went in the tank. TONS of dead sea stars in one box; put a few in where I can watch them to see if they come back. The rocks smelled great--no funk at all; just salty; little iodine. All in all, I am extremely happy with what I got from y'all--excellent quality; *LOTS* of little things too numerous to name just out of the box. Can't wait to see what manifests itself over the next few months. Just like the old days!!" "Man the rock is......stinky!! Haha, no it was great! Really, really, fresh! Overall, the rock was awesome man! Very porous, almost perfect pieces. It was covered in red, pink, orange, purple, and a little bluish coralline algae. I have been doing water changes daily...about 25-30 gallons. Taking 3-6ppm ammonia down to 1-1.5. Been cycling since Saturday. Have the salinity around 1.020-1.021 and the temp 71-73, just like you said. Have only had light on while I'm doing the water changes. I am hoping to go to every other day, or every few days here soon. I think with the next water change, I'm going to situate the rock into the places I actually want them in the tanks. I have them spread out now for circulation purposes. Thanks again for everything man!" "The Fiji Pukani is awesome! What impressed me the most was the size of the rock in addition to the quality. I wasn't expecting such large pieces and was very appreciative of them. I can't wait for the rocks to come-back to life to see what sprouts out of them. Thank you Mitch for making this all happen ... it was painless picking them up at the Air Cargo Terminal. I'll be happy to tell anybody that calls that you guys are the BEST! Keep up the great work!" Thanks again Ray U. for photos! And here is a Ricordia (of a rock-full) that has been coming in the Viet Nam boxes. We can't guaranty anything specific in the mixed boxes, but lately the boxes have been having two rocks covered in these beautiful Rics. Thanks to Robert V. of Grand Rapids, MI for his photo. Thanks to Frank C. for photo! Recent photo of Fiji acropora ... thanks Richard V. for pic! Sorry to be slow between notes here! We've been busier than a one-eyed squid in a school of sardines. Here is a note we just received a couple days ago about the air-freighted real deal live rock we get for you. The Fiji Pukani is awesome! What impressed me the most was the size of the rock in addition to the quality. I wasn't expecting such large pieces and was very appreciative of them. I can't wait for the rocks to come-back to life to see what sprouts out of them. Thank you Mitch for making this all happen ... it was painless picking them up at the Air Cargo Terminal. I'll be happy to tell anybody that calls that you guys are the BEST! Keep up the great work! Note that you have a day or a few to get any Indo live rock orders in, a shipment is scheduled for March 11 or 12 to LAX so far. It could float a few days, but it is on with a planned arrival late next week. If you have Excel on your computer, ask for our most recent updated availabilities. Otherwise the .pdf&apos;s on our .pdf lists page are updated fairly regularly and usually still 98%+ accurate. Only the rarest items change. There is lots of great stuff coming in as usual. We hope you all had a Happy New Year and enjoyed the holiday! Again, we want to thank you for your interest and support! We really appreciate it! In general, the overseas suppliers are all on their normal schedules. Everything is coming in as usual. The MLK holiday doesn't affect shipping, but in early February there will be Chinese New Year for which some sources go off-line for a week to celebrate. March sometimes starts to have CITES issues as the prior year allotments run out. Now is a good time to order for most places. Fiji just missed a week due to bad weather and consequent bad seas, but a rare event. Their corals and fish are great, usually every week. So you know not to worry, we pay real close attention to weather, and of course lots of heat packs to some areas are the norm now, four to six per box if need be. We even heat pack live rock when and where neccessary. Most weeks we can get to most destinations without problem. Just got this today ... thought you all might like it. This shipment was bumped from the direct "red eye" flight it was booked for and went out in the morning, arriving in the late afternoon, which is not uncommon, and not anything to worry about. Just a quick note about shipping schedules as we approach the holidays. The week prior to Christmas is the hard week to ship. Besides the additional passenger load of holiday travelers, the U.S. Mail load is heavy with cards, and mail takes precedence over fish shipments. The week in between Christmas and New Year's is usually fine with no problems, all the people and mail have moved already. New Year's falling on a Friday is good as most will have travelled back home by that Sunday Jan. 3rd, and so that shouldn't be a big problem either. Order cutoffs will still be the Thursday prior to those holidays, on the "Eves," but earlier is better before the suppliers split for the holiday. We do not yet know which shippers will be closing when though. Some do take a week or two off, often between Christmas and New Year's, and or the week after New Year's Day. So, often a source or two will be off-line a week or two. There are often are alternatives too, so inquire. Actually, Ramadan later in January and the Chinese New Year just after that, often have some Indo sources shut down for a week or two. We will post when we know if a key source is going off-line for a holiday break. We did get a few hundred pounds of some awesome fresh Fiji live rock in this week and by all accounts it was spectacular. We don't know when the next shipment will be yet, be prepared to wait a bit, but it will be more than worth it. It is limited, so best to place your order to be in line. "The rock is fantastic. Great shapes, unbelievable colors. I am very happy with the rock. It is just like Vanuatu. Thank you for getting it for me on such short notice." - Terry L. from PHX. We want to wish everyone a very Happy Thanksgiving! Have a great holiday! Don't gobble too much turkey! In some wet news ... Fiji Acropora and the nano boxes (which are big smalls) are coming in great. There is a hiccup in the air-freight fresh Fiji live rock supply momentarily, which should be fixed any day now. Indo live rock is off-line presently and the Fiji Pukani has been better the last several months anyway. Shoot us an e-mail if you want any fish or coral lists. Mostly, we are thankful for all the great folks that have supported us over the years! You! We have the best customers in the world. I mean cool people, nice people, real people, good people. We thank you very much! in the greenhouse right now, but probably not for long! They can be included with any coral or fish order. "The corals are being acclimated now. They look to be ok for the most part. I think I got about 90% of things that I really wanted. Subs are great too though. Got a notice from paypal the the refund has been issued to my card (for the difference in estimate and received). Thank you for your great service!! Much appreciated. Very happy with the corals and the whole experience over all. 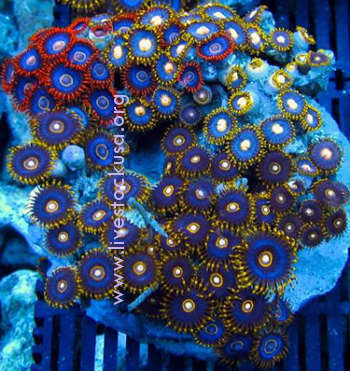 Not all zoas opened up last night so I can't wait to get home and check them out. I service a couple of reef tanks and supply the owners with a few frags here and there but with these newly acquired beauties I should be able to take my coral farm to a new level as well. Once I recover some of the cost of the last order I'll be looking to add more variety. "Got a nice box with more pieces than expected. Pretty sure I ordered a yellow finger coral and they sent green also. The green leather is actually bright green and open ;) Everything looking great btw. Everything opened up nicely as soon as it hit the tank. The 2 fish are in great health as well, eating like pigs a couple hours after being in tank. I appreciate that. Will definitely be ordering again. "Fiji is once again A Grade rock. One piece that they sent may turn out to be THE NICEST PIECE THAT I HAVE OWNED and I am probably at the 500lb. point of my rock experience. It&apos;s a honeycombed piece a little bit bigger than a football with some unknown patches of growth, fully encrusted with coralline. Nothing dying and a sweet smell, it went straight into the Tuskfish tank along with another sweet piece so that I can baby them. (My algae scrubber is fully mature but really only idling with all the rock filtration I have a small bioload.) Another BIG score for my system! If someone asked me for a rock recommendation at this time, I would say Fiji. THANK YOU SO MUCH." "Well, got the heavy box of Vietnam Ultra Soft Corals today from the airport before 2pm. The combo rocks are certainly amazing like you told me!! These rocks have a couple different types of sinularia and sarcophyton on them, various zoanthids, rhodactis, ricordea, green star polyps and a few other oddballs that I'm not sure. The guys that repack these corals do a great job as well, no leaking bags and the combo rocks are probably five pounds or more, no leaking! The bags were double or triple bagged, with some dry newspaper in between the two dry bags which helps protect the corals. Need to brush up a bit on my Vietnamese though. :) "
"I see another box of them in my future too! They fill the tank in really nice and the colors are really bright. I wish there would have been more blues and reds, but all of the shrooms looked great." "The eagle is back at the nest. All eggs look great with only 1 out of 15 that bleached out . I'm more than satisfied . Walt sent the real deal again !! Thanks again for the super service ! Always top notch, I'll be in touch again soon." These customers said it better than I could, and y&apos;all would think I am selling instead of just tellin&apos; it like it is. Everything IS great! Fiji Acros are awesome, as is the fresh Pukani live rock from there now. 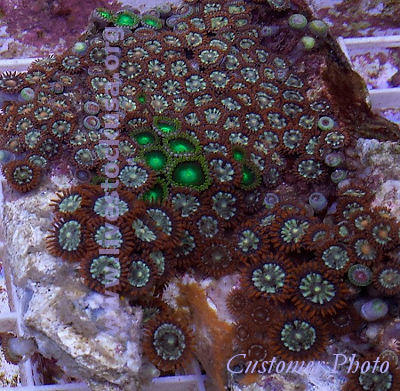 The Jakarta WYS is great, so is Kupang, and Viet Nam is hard to beat for softies like shrooms and zoas, those Ultra combo rocks are awesome. Sure you might get a dead here and a sub there, but you mostly get a box of things that just are not available locally for most folks. Or if so, they are double the price, or more. Send an e-mail if you want the most recent list (excel file) of availabilities. "Thank You Very Much! This is VERY nice rock! No dense pieces and excellent variety of life. A grade for sure. :-) "
"Hi ... I wanted to let you know the Bali-Prop acros are outstanding, all alive, and very healthy. I couldn't be happier. I've taken some pics but need to play with them to get the right color representation." We hope you are having a great summer and some nice va- or stay-cations! There is scuttlebutt about an Indo (Java) live rock shipment coming up shortly. So if you are thinking about it, get your orders in soon and quickly. Of course, the real deal air-freighted Fiji is now available weekly with fish and coral shipments. Lots of good corals and fish are coming in lately. For soft corals the Viet Nam is hard to beat, some mighty fancy stuff shows up in that Ultra box. I never saw a hot pink finger leather coral before. Fiji wild Acropora are amazing as always and their other stuff is just as excellent, SPS, LPS, softies, and the hand-caught fish. The Bali cultured Acros are great, but intermittent, every few weeks on average. Fiji is weekly like clockwork. And don't forget that Fiji nano box if you want a bunch of growouts, they are great good sized smalls now. We have fish coming weekly from Kenya for those that want something different (Indian Ocean) than the usual. We have a couple of great Philippine suppliers with excellent fish, as well as four Bali shippers that have great fish. Just ask for a list if you want to see availibilities. Besides Fiji and Bali cultured Acros, most weeks Kupang ships and is great for assorted coral boxes. Most weeks one of the Jakarta guys is on, either the WYS place, or the real inexpensive one (Jakarta-T). Some weeks Tonga is available too. You can always check the Fish or Coral List Central pages for recent pdf format updated lists that you can download directly with a click. Most of them are mostly the same all the time with just minor changes any given week or three. We hope y'all have a great end to your summer! 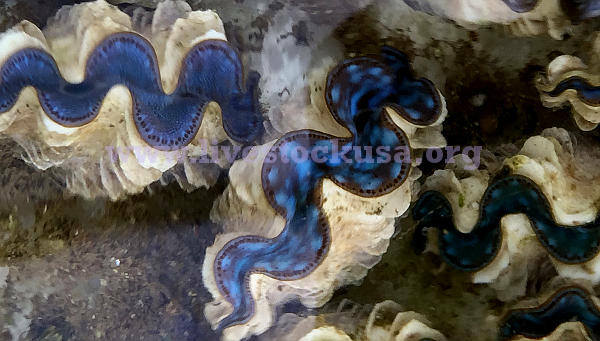 Check out the new ... Tonga and Tahitian clam photos on our Greenhouse list! There are also some new pics of some Ultra Viet Nam thanks to LLaura who shared some with us, and you! Have a Happy & Safe Independence Day! If you are looking for Java (Indo) live rock, it is scheduled for the week after July 4th. Orders must be placed by Thursday, July 2nd. It will be about a month or two until the next shipment arrives. Fresh, air-freighted, A-1 Fiji is available almost weekly or nearly-so. There is a wee bit of Tonga corals coming in again! 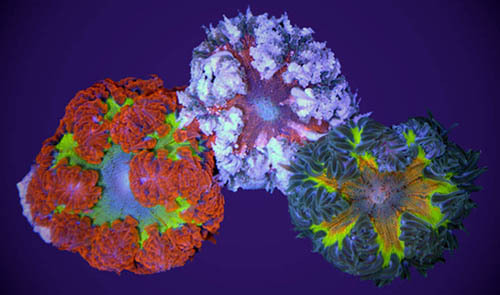 We don't know if this is going to become a regular event, but there are some of these World Class corals now available. They are on par with Aussie corals for color, quality, and variety. A bit pricey compared to the old days, but cheaper than Aussie and there isn&apos;t anything like it. It is very reasonable for the pieces you get. As for Tonga live rock, we very highly doubt the rock will re-open. Kenya (I.O. ), Philippines and Bali fish are coming in great, as are Kupang and Fiji corals. The Bali cultured Acros are astounding, you just have to wait a week or two or three between shipments, but always more than worth it. I have fraggers telling me they are seeing stuff they have never seen. WYS fancy high-end Jakarta is every two or three weeks, ask for the next list if you want to see what they have. Note many of the source lists are up on the fish or coral list central pages. They change barely by a few items per few weeks. There are some lists available as .pdf's, so you can read them with Adobe. There are a few things going on you should know. First, there is some fresh real deal air-freighted Fiji Pukani live rock available that is very good. So although there is yet to be an Indo live rock shipment this year, there is now an alternative, for real deal air-freighted old-school live rock. Everyone has said it was good to great. The annual CITES quotas for the next year of coral exports from the Indo quadrant have been set in April as usual. But they have been slow to get the new paperwork (permits) into exporters hands and some have not shipped the last few weeks. A live rock shipment is merely awaiting the new 2015 permit. Even cultured Acros have been thin due to CITES, but great. We have a few different Bali sources and they each have a slightly different list. On average, each one ships about once per month. On most weeks, one of them is &apos;on&apos;. You should try all three. Kupang&apos;s are great too but assorted only, no picking species like Bali. Fiji has a hot water problem that has only affected the regular Acropora. They have the cultured nanos and some few large-XL sized, but none of the usual great medium wild colonies (the 12-15 pcs. boxes). Australia has had a terrible typhoon season and has not shipped in months. We are waiting to hear from them, but they won't ship until everything is great. The runoff silts everything up, colors fade, so they don't ship. Some few Red Sea type fish are available about once a month via Sri Lanka or Philippines. The rock has exceeded my expectations .... there is so much life on the rock ... I think there are literally 7 different colors of coraline algae - greens, pinks, reds, oranges, purples. There is lots of other encrusting life as well. Three several inch sponges (2 orange, 1 red) survived. There are these beautiful little dark maroon and bright green tube-like structures clustered on one rock that lived. Lots of kinds of macro-algae. There are these incredible light-blue dots on one of the pieces of rock that look like some kind of small growth. On one of the larger rocks, there must have been an encrusting SPS coral they removed because I see 3 separate areas-patches on the rock where the SPS seems to have survived! I don't understand how the SPS is living given my ammonia levels, but it is. I've already given a little VHO light each day because I don't want the SPS or coraline algae to die. I have a clean-up crew in there, so I'll monitor the algae growth. There is a small dime-like dark purple encrusting organism with little hairs that is beautiful - I have no idea what it is. The list goes on and on. And to top it off, last night when I put on a small strip of LED blue lights, some of the red encrusting coral (it must be soft coral I think) were glowing neon colors! I had never seen anything like that before as well. The rock was packed very well with a great variety of small, medium, and large pieces. I feel sorry for people who by dry rock because there is no way they'll ever have the diversity of life in their tank without fresh-shipped rock like this. Bali and Philippine fish are great as usual and easy to get. The Viet Nam softies are awesome too. E-mail us any time and ask for the most recent updated lists, or to get on our regular updates mailing list. The Sri Lanka and Kenya lists are now up in pdf format at the Fish List Central page, and at the bottom of the new Indian Ocean article. If you want to see what is goin&apos; round in the way of I.O. fish currently, you may see lists below. Here are a few notes we received in the last couple of weeks, both on shipments of Bali-prop cultured Acros and SPS. The first one is a link that has photos (washed out, not with the best color) of some of the Acros, one neat comparison shows how they are paler when they first come in, then afterward with about a week of light (#17 & 17a). Bali-Prop is not every and any week, usually every 2 to 3 weeks. It is limited so the thing to do is get your order in, or as you know it, hurry up, and wait. ;) Next planned is March 29 as of right now. That can change, but it came in the 1st and 15th, and is planned for 29th now. Here is a quick rundown on what is coming in this week. Arrival day to you is a day after the LAX arrival day. Ask for any list you need, as they become available we will send (or use the last one you received). Order cutoff is Thursday late afternoon. Sri Lanka with Red Sea fish - RED SEA! Still free: ask for any list you want to see! Check out the new photos of some of the corals currently coming in from Kupang. It is one of the best places for a box of cherries. 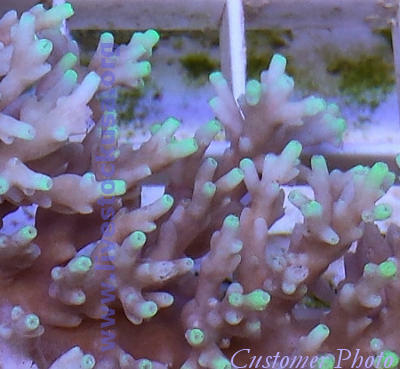 These pix are of corals shipping this week. There is some bit of Red Sea coming in via Sri Lanka now ... ask for a list! They have a fair selection of the Red Sea specialties, not to mention all the great I.O. fish from Sri Lanka and the endemics from the Maldives. Australia is back up and running, finally, so that is again another option available every couple of weeks. The &apos;Aussie-B Box&apos; special is a great deal on Great Barrier Reef corals. See below on the Dec. 18 update for a description of the Aussie B box special. Remember, if you have trouble getting through on the 866 toll free, try the 855 toll free which rings to a cell, not a landline. Hope you all are doing well, not too cold and not too snowed in! Here are a couple great specials. And these Viet Nam softies are fantastic pieces for the price! A 25-piece box of Viet Nam soft corals, spectacular mushrooms, zoas, and mixed soft corals, for only $650, or only $26 per piece! You can get half soft corals and half shrooms, or in thirds of each category: softies, zoas, and shrooms. Or all of one. Have it your way, just let us know how you want it. These are large pieces and outstanding quality. To see list of corals for this special please see link below for Viet Nam list, but note that in order to receive the special, you must use the ordering button below! Thank you! Meanwhile we hope you stay warm! We have very recently moved our website to a more efficient server ... our apologies during the transition, just in case some of the pages have not loaded for you properly! We hope to get all of the wrinkles out soon! Thanks for your patience! Happy New Year all! We hope you got plenty of fun, food and family. A few of the foreign exporters are still not back on line yet, but most are back up and shipping. There are corals coming from Fiji, Bali, Kupang and Indo, great fish from Bali and the Philippines (not to mention Fiji and Kenya), and cultured Acros are usually every couple weeks and are back up from the Java-Bali-Kupang (Indo) area. Red Sea is still off-line. Our last live rock shipment arrived in December. We do not currently have a date yet for the next shipment, although it should be in a couple or a few weeks from now. Sometimes we can get a box or a few tacked onto a coral shipment in the meanwhile, but not always. We ask for your patience since fresh live rock is so limited right now, it is always sold out in advance. There are no extra boxes, so you have to order and wait to get the real deal air-freighted, but we guarantee you'll be glad you did. There isn't anything else like it nowadays. Note there is some Tonga boat rock out there, but it looks like Fiji boat rock, deadish concrete. Coralline may grow back but that is usually about it. Keep in mind on the horizon out in April there will be the annual CITES permit meeting and quota-setting in the Indo area, which means they will probably run out of permits for some types (most popular) of corals starting in March. Think and plan ahead! The Fiji Nano corals are outstanding. They have grown out quite a bit and are at least a good sized small now. They run silver dollar (2") size and up to 3" per colony. You can get all Acros, all hard corals, all soft corals, or a third of each, or half each of two categories. It is a great assortment of all the cultured corals from Fiji. They are ON SPECIAL NOW, for $18 per coral, F.O.B. LAX, no additional charges. That includes the re-ox and Fiji box and packing charge that is normally extra. 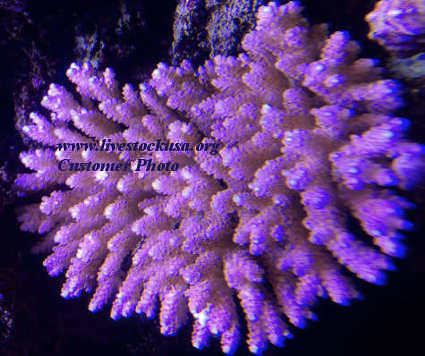 See pix on our Nano Corals page. Note ... the color in the photos is yellowed or washed out due to poor lighting for the photos. Just a quick update. Due to the holidays on Thursdays the next two weeks, the order cut-off days will be Wednesdays ... which, of course, means Christmas Eve and New Years Eve. Birdfish will be here and sober to take your order on those days, but not too late. ( LOL ) But we know how busy those days can be so it might be good to plan to get your orders in by Tuesday for the next two weeks, so you know you are free on the "Eves!" Thank you all for your support and interest, we really appreciate it! Happy Holidays to you and yours, and that includes your fish! Our best wishes for a healthy, happy, and prosperous New Year! Note this NEW Australia SUPER SPECIAL! Usually during Australia OFF weeks there is another shipment that is a great deal. Every few weeks this super special is available. It is a "shipper&apos;s choice" B-grade special. You get one box with 20 medium corals, an all different assorted selection of above Australian Great Barrier Reef corals. Most of these will have been collected as A-grade. Many report that with proper care, feeding and light in a couple to a few weeks they are A-grade. They became B-grade during the process, and then put on special. They were the less than 5-star stellar pieces. Some were A-grade, but with a ding off a corner, a broken branch, etc., so now it is B-grade. The boxes usually have a good number of the high end favorite items like an Acro, a Scoly, an Acan, a Torch, a Lobo, etc., among the selections. It is only $800 F.O.B. LAX ! NO additional charges. An amazing 20 Australian corals for $40 each and your Great Barrier Reef is on the way! The boxes are limited in quantity and the way to get one is order and the next shipment you are in. If you order the week prior to it happening, you can order on a Wednesday (Thursday at latest) and have them the following Monday. But best to be ahead of the curve a bit since very limited. To order, please send an e-mail or call. TIME IS RUNNING OUT FOR THIS YEAR! LAST CALL for live rock this year! The shipment is scheduled for next weekend or early in the week after. There are a few boxes left available, but order by Wednesday! You can get branch, shelf, regular or large pieces ... just let us know which type you want. Hurry up and click the button before it&apos;s too late! Also note since a lot of coral shippers&apos; schedules are every other week (most fish are every week), there is only one more chance for many to ship before the mail load might start causing problems. Order now if you want some new corals before Christmas! Live Rock will be coming in December, but if you want some you need to order in advance, ASAP. It is a very limited supply now, it will sell out since there is just one source for the real deal 5-star A-1 stuff we are famous for. Shown here are a couple pictures they sent of the next shipment. It is in vats curing awaiting export date. Those who get their orders in early will be sure to get this beautiful live rock. Current forecast is mid Dec. arrival to LAX (and you). to our Shipping Information page, so you know you don't have to worry about it. Here is a great special offer for you, but it won&apos;t last and is very time-limited! On the Bali or Philippine tranship fish boxes, they are both on sale for $250 for the inbound tranship charges per box. This covers the international air-freight, foreign box and packing, U.S.F.& W. and Customs clearance at LAX, with re-acclimation and re-pack at LAX. Then add the contents of the box (the fish you choose for the box), and the domestic shipping LAX to you. E-mail us for a current stock list! Check out these pics of the Fiji Nano corals, these are 2" plus some pushing 3" and you can get all Acros, all hard corals mixed, all soft mixed, or any combo thereof. We have created three new short slide show videos of leathers & softies, shrooms, and polyps which are currently coming in from various suppliers. Some of the slide shows are smaller photos than we would have preferred, but they are some of what is coming in now. They are featured at the bottom of each of those pages, as well as on our YouTube Channel. We&apos;re sorry to report that our Fiji Super Special is over. The good news is that it&apos;s not going back up to where it was before the special! The regular price for a box of Acros is now $650 (they were $675 before the Super Special). This is for the large-XL or the medium Acros, and the assorted boxes of corals you choose. Large-XL will usually be 7-10 pieces, the medium 12-16. Sizes fluctuate a bit and pack is adjusted to make the best box for your order. Fiji has great hand-picked fish and corals! Also, Viet Nam has a small price increase so we have to end those specials. The fancy Viet Nam "Rare, Limited & Premium" ultra box with the insane combo rocks, shrooms and zoas is back to $900 as it was before the special deal. It is still a steal. The regular boxes of Viet Nam softies, mushrooms and zoas are also back to their regular prices, which are also a steal for the rare unusual and not run-of-the-mill types you get. Below in the October 15th update, there is mention of a 6 piece box of the Viet Nam Ultra Rare Premium Combo Rocks. If you order that we will give you one of the Med.-Lg. Alien Green Flower Leathers for free with your order! It is normally a $40 coral on its own, and double that or more in a store. You can cut it in half and have two $40+ corals. Here is something new and exciting! for the "Viet Nam Rare Premium and Limited" box. Until now, the "Fancy Box" has contained an assortment, with a 24-piece minimum per box. We are now able to offer a box containing SIX pieces TOTAL! 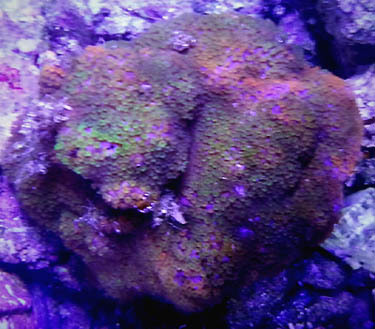 This is SIX big rocks covered in ultra shrooms, zoas, and often a softie. You might even get an Alien Neon Green Flower Leather in the mix! Everyone who has received these has been blown away. 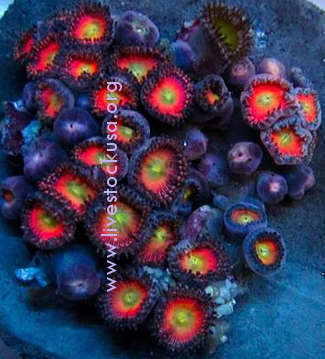 They are cultured with a combo of ultra shrooms, zoas, and sometimes a soft coral of some sort. These types of pieces have been have been cracked, cut and chopped up to sell for $200-300 for what was on a single rock. The box of 6 pieces is $525, or $87.50 per rock. As usual, the air freight from LAX to you is paid to the airline when you pickup your order. So if you were drooling over those pix, but could&apos;t handle the whole 24 pieces, here is a way to just get the Premium Combo Rock part, which are stellar ultra show pieces each and every one. On a related note, you can also get anything from our Greenhouse List easily added to any order or ordered separately. Beyond snail and crab lots, there are no minimums besides making up a box worth (if you aren't getting anything else). It is a small selection of a few dozen neat items regularly kept in tanks on hand, like Yellow Tangs, Flame Angels, Alien Green V.N. Flower Leathers, some clams, snails and crabs, Blue-dot Jawfish and a small selection of fish running from Fairy Wrasses to Passer Angels. All tanked and eating. Here are a couple notes from customers from last week&apos;s live rock. The only problem I have is that I wish I had a bigger tank so I could put more rock in. The pieces of rock are awesome, much better than I had ever hoped for. I am soo happy that you talked me into getting the Indo rock. I am totally blown away by the quality and the unique shapes I received. When I placed the rock in the tank last night it came out so much better than what I had pictured it would look like. Thank you for making this the easiest and best experience, I can not say enough good things about the rock. Great man. The algae (macros) were great looking. The newspaper kept most of the moisture on the rock. I am 100% satisfied man, best live rock in the U.S. Thank you so much. It looks great, seems more like branch rock than previous shipments, and a bit denser so there's less. However, the quality is amazing. When I picked up the rock to put it in tubs, there were things literally crawling on it, this is the freshest I've ever seen. Good timing, the Molecular Bio class will be doing scrapings for their experiment in metagenomics TODAY! Thanks for coming through again, everything worked out great. Talk to you soon! October 1st - Fiji Acropora - 12 pcs. Thanks for everything. Very nice and healthy pieces! On the Fiji Acropora we have a large box and a medium box. The counts are estimates. The 8 piece Large can be 6-10 pieces. The 15 piece medium can be 12-18 pieces. The fewer pieces indicates larger pieces were used. Which cost more and take more water to get here (freight). So if you get a 12 piece box, they were bigger than the planned 15, and Walt made a call that these were the best box he could make for you. He may have had 18 good, smaller ones too. Same with the large. They average 8, so that is what we estimate it at. If only 7 fit in a way that they will arrive alive it is because they were bigger, they cost us more, cost more freight. So whether a box is 6 or 18 pieces, the price is the same. We just try to get the size you want, mediums, or larges, or nanos if you want them (40 to a box). Just to keep ya posted on happenings..... Red Sea is offline for the time being, all the Indo area (Bali, Timor, Kupang, Java) corals are coming in great, and so are Bali fish. Viet Nam and Fiji both are excellent now too, see the specials in prior updates below. Some live rock is supposed to be getting ready to ship soonish, get your orders in if you want some real deal fresh air-freight live rock. One of our customers has been selected as Tank of the Month at the Washington Marine Aquarium Society web page. Click the link for a new video with lots of good footage and some stills below to see the fish. When I told Coral Hind how great his tank looked he said something to the effect of "in no small part due to all the great fish I got from you." I like it more for other reasons, but, yes there are lots of our fish in there, perhaps most of them. I see lots of our Bali, and some greenhouse stuff..... and they all look great. The tank is beautiful, so we wanted to share it with you...... Thanks and Congratulations Coral Hind! Here is another recent customer comment ... in an August phone conversation, Bob M. in WA had this to say about the Fiji 10 piece special with 6-7 LARGES that he and a couple buddies split ... "We couldn't believe how big some of the pieces were. I never saw a yellow spaghetti leather like that, it was so big we could make two large larges out of it. I saw a red favia just like the one you sent, online at one of those fancy shops for $180. Same piece. Yours were great, huge, we were very happy." If you want some XL corals, it is the way to go. 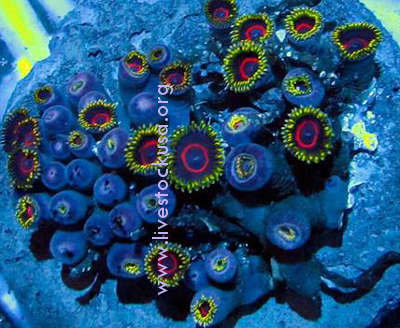 Check out the new China Sea Zoanthids available in this one minute video slide show, they are beautiful. Here is a reminder about some current $600 special sales. Any of the following boxes can be had for only $600 right now! There is something for everyone with special deals on boxes of mushrooms, zoanthids, and soft corals from Viet Nam that are great. Fiji has the best wild Acros, and their other assorted corals are A-1 too, you pick what types go in the box with the regular corals, the Acros are assorted. Fiji mixed box of 12-15 medium pieces of your choice. 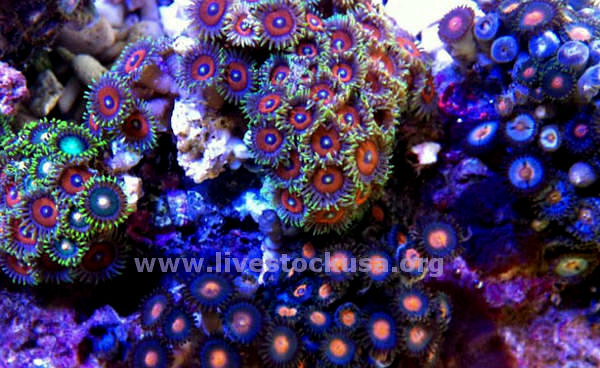 Here are some new extreme zoas from S.E. Asia ... small and expensive! This mini super red carpet anemone is 2+", maybe 2.5" across. We hope you and yours have a great FOURTH OF JULY! There is some Tonga boat rock that just got here and it looks surprisingly good! It will be a hard cure but shapes are typical Tonga great, and there are colored corallines on it, so it remains entirely salvagable with proper care. It will take a couple or a few months of care, but it will get good in time. Great project rock! Tonga is notorious, in particularly, for their shelf and branch live rock and is now shipping this once again ... it may be via boat, but with the unique shapes it offers, it&apos;s a real treat! If you want some live rock you don&apos;t mind spending a little time working with, this would be great for that. There is shelf, branch, and regular available at $3.25 per pound, with a 100-pound (2 box) minimum, as the boxes weigh 50-pounds. There is also another source which does not require a minimum, however, the price is $3.75 per pound for a 50-pound box. There is no date yet set for the next air-freight fresh Indo live rock shipment, they are collecting orders, the rock is in the vats and essentially cured. Many of you know the drill ... hurry up and order, then wait, just when you are about to give up, it will come. All of a sudden they announce it&apos;s coming and it's over and done until next time. They don&apos;t order extra. Just to remind, there is a $600 sale (see most recent prior update below) on Viet Nam boxes of soft corals, zoos, and amazing mushrooms, all of which are outstanding! These are the best in their class, fancy fancy soft corals and especially the mushrooms, at the best price, less than $30 each for 20 large covered rocks, many will be types of mushrooms you haven&apos;t seen. There is also a box of 10 Fiji mostly large to extra large size corals for $600 as well, you pick the pieces in it (it might only be 8 pcs. if just large Acropora). Again, scroll down to earlier prior updates for a special button for it where mentioned. Bali fish are coming in great, so are cultured Acropora. Kupang and Timor have great selection of a very high grade of Indo area corals. Check out our Coral List Central or Fish List Central lists, as most of them are 99% the same all the time. Fiji has great wild Acropora colonies, and good fish too, besides their 40 piece nano-box. A new slide show has been added to our Live Rock Photo Gallery, which features a variety of live rock over the years. Super $600 Summer Solstice Sale! Have we got a deal for you! Here are a of couple of super $600 Summer Solstice specials that might interest you! First, we have some really great Viet Nam soft corals coming in. What we call &apos;the regular&apos; is named such for the regular shipments, compared to the other Viet Nam supplier, whom is more irregular. Perhaps that word though gives the wrong impression, as the pieces are outstanding compared to many other soft coral sources. Big pieces (softies) or rocks covered in shrooms or zoos. Hand sized pieces. Covered. In colors. Like Indo was 20 years ago. These are the &apos;regular&apos; boxes of Viet Nam as described on out Box-lots page. But they aren&apos;t regular pieces, they are big, world class, awesome beauties. please use the ordering buttons on this page which automatically adjust for sale pricing! Same deal on the "regular Viet Nam" box of 20 zoanthid rocks, or on the mixed box of 25 softie corals, which can be 23-27 pieces, most are 25, $600! 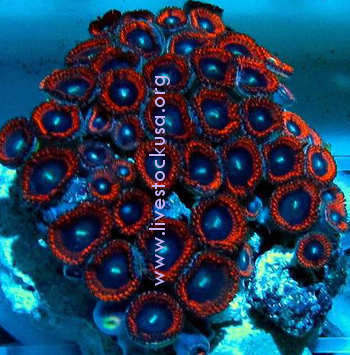 See list of types on Box-lots page, it is a great variety of all the best shrooms or softies, there are four colors of zoas. The softie box at $600 is $24 per coral, a steal! You can even order a box of half and half of the shrooms and zoos, figure 20-22 pieces, about ten zoos and 11 shrooms of each, big rocks covered in mushrooms and zooanthids. $600! Again, this is not the super ultra rare limited combo box supplier, but the regular one. The &apos;regular&apos; are likewise typical Viet Nam A-1 5-star awesome quality pieces. This is the best mixed mushroom box you can get anywhere. You will get lots of shrooms you never saw. Piece size is Large to Extra Large. Viet Nam Mushroom Rocks - Mixed box will have mostly one of each kind they have. Green Stripe, Marble, Violet Blue, Light Green and Light Blue Ricordea, Maroon and Green Striped Maroon Discosoma, Green Discosoma, Red, Green, and Blue Velvet, Dark Red Tonga, Asst. Tonga, Blue Tonga, Green and Purple Tonga, Green and Orange Tonga, Blue Bull&apos;s-eye, Orange Ricordea, Neon Green Ricordea, Purple Ricordea, Green Ricordea, Green and Purple Ricordea yuma, Neon Green and Metallic Discosoma. Viet Nam Zooanthid Rocks - Zooanthid rocks include four main types of zoos from Viet Nam ... mixed colors, red, green outside with red center, bright green. Viet Nam Mixed Soft Corals - Soft coral assortment includes Foxtail Hairy Tree, Sabellastarte, Sinularia pavida, Yellow Finger Leather, Yellow Toadstool Leather, Blue Echinogogia, Sea Fan (Purple, and Red & White), Orange Tree Alcyonium, Blue Clove Polyp, Gorgonians, Dendronepthya. Two or three of each type make the box. For you "SPS heads," we have a super special offer on Fiji Acropora. 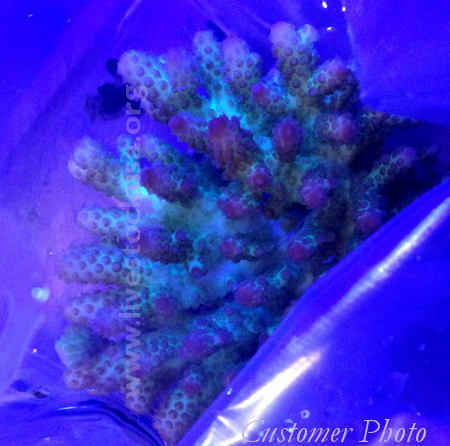 A 15 piece box of assorted "fancy colored" (as Walt calls them) Acropora is also on sale for $600. These have been coming in very nice folks! This is $75 off, and a steal for these types of pieces at $40 each, five dollars off each full wild colony head. But jump on it, this won&apos;t last long! Fiji arrives to LAX Wednesday, to you Thursday. If you want a box of anemones, the regular Viet Nam place is also the spot. Sometimes it takes two weeks to fill the orders, but they try to ship every week (it&apos;s the regular place). The anemone box is 50-60 anemones mixed of all types: Colored Carpet (most are super neon green), Long Tentacle, Saddle, Bubbles, Tube, Sebae, and some various assorted types. 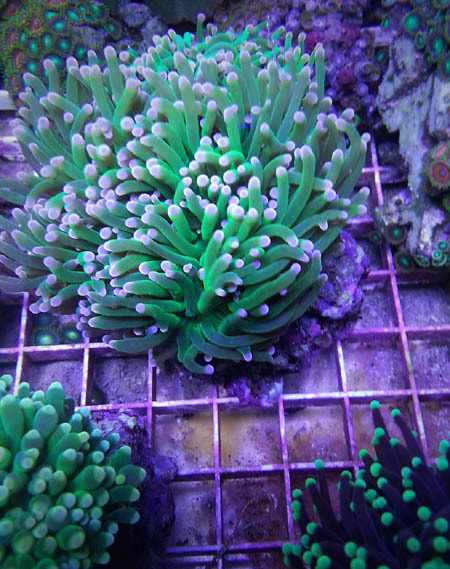 The carpets will be a foot plus when open, this is the best anemone box available, there will be very few to no DOA, like everything we handle. Only the best here folks, or we don&apos;t sell it. This box will be estimated, and settled after we know if you got 50, or 60 anemones. They are $15 each. So we estimate at 55 pieces which = $825. If you get fewer we will refund the difference, if you receive more, you'll owe us a few bucks. Please send an e-mail with your phone and airport after ordering, if you aren&apos;t sure we already have it. Remember for most sources, cut-off for orders to receive the following week is Thursday. It is already Friday over there and they have to finalize permits to ship so need a list in hand by then at latest. It is always even better if you order by Wednesday, but Thursday is cut-off for most sites. We can still get a Fiji order in on Friday since it doesn&apos;t ship on the weekend like the Indonesia area sources do. See ya at the $600 Summer Solstice sale! Check this out! Here is a movie slide show of an awesome tank worth seeing, it's just a few minutes long. This cool cat Francisco sent us a bunch of photos of his tank and corals and we wanted to share them with you. The corals are from our boxes of Fiji, Kupang, Timor, and Viet Nam. Sweeeet stuff there! Note - If slide show appears pixelated, adjust your youtube settings wheel (resembles a gear) on the bottom toolbar on the video screen, which is at the left side of the right hand group of icons, second from the left, to HD after you have started the slide show and it will correct the resolution setting. 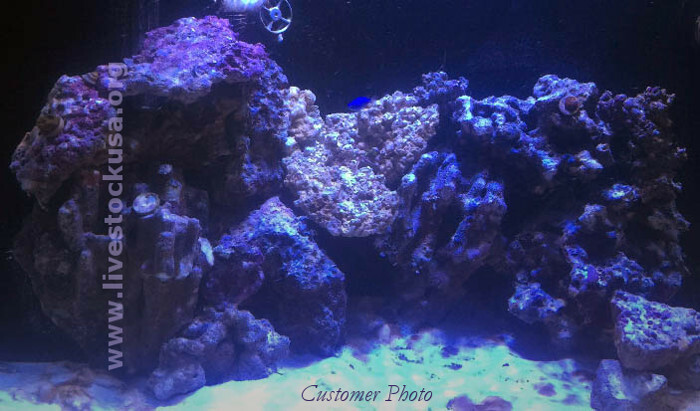 If you have a tank full of our live rock, or corals, you can send us a set of pix, maybe a half mb each, they don't need to be big, and we can put up a slide show of your tank. Or send a video of it, say 10mb, and we can put that up. Thanks! Just a reminder, we primarily sell hobbyists directly, all you need is a shipable U.S. airport, no permits. We also do sell to stores and businesses, with different pricing IF you have a biz license, FNS or DBA, only. With documentation that proves you can be a long term regular customer, you can get a better deal. Please don't say you are a store or biz if you don't have paperwork that says so. Then you'll feel uncomfortable just asking for the regular lists. Which you'd be better off having than not. We sell some coral farmers, clubs, and group buys, but the latter two are not really a biz that is going to buy every month for a long time, so please consider the difference between that and actual wholesale customers that buy monthly forever. We do give deals to regular repeat customers (just ask Dave-LOL), and those that buy multiple boxes. Ask, but be honest about your situation please. We have excel file lists with many different suppliers on them, free for the asking, you can check out a dozen fish or coral suppliers lists, Australia, Bali, Fiji, Timor, Kupang, Viet Nam and others. 90% of which are the same the last 10-20 years for species, only prices have changed, guess which way. Our prices are a little higher in some cases, because we just don't handle the cheapest stuff that is so widely available. We get the best but it is never the cheapest. Maybe some of you have noticed that ... ? It&apos;s a matter of, "Do you want the real deal or do you want cheap?" The only way to get both is to buy one of each! They are never the same thing. Good ain&apos;t cheap and cheap ain&apos;t good. We&apos;d rather explain our prices once, than have to apologize for our quality forever! Sometimes you even have to wait an extra week or two for it, because there just isn't that much of the real deal good stuff. Corals are coming in great to fantastic, outstanding to amazing, Kupang, Timor, Fiji, for hard corals. Viet Nam for soft, that "Rare, Premium & Limited" box is off the charts mind-blowing for zoos and shrooms, not to mention that alien green cabbage. The price is going up, so order it now if you want one at this price. Fish are very good, always a couple dead fairy wrasses, but overall great. There is no date yet on the next live rock shipment, the last one was great, another should be coming soon. The wethead is not dead, at least here, we&apos;re for them! The GREAT news is that the new CITES quotas for the year have been settled and permits for hard and soft corals are being issued! There are some types that are still very limited and their prices will stay high, the rare fancy stuff. The per piece cost is $1.25-$1.50 now, per rock or coral, just for CITES permit charges. With the new permits, there will be another live rock shipment shortly, everyone loved the last shipment a couple weeks ago. Get in line quickly though (hurry up and wait), it will be soon, and it sells out. Bali fish are coming in well, if you can get a box (15-30 fish) at a time it is a good way to get fish you might not be seeing at your local store, and fish that haven&apos;t been in the trace element deprived disease farms of some of the L.A. wholesalers. We have a couple of very, very high quality suppliers to choose from. 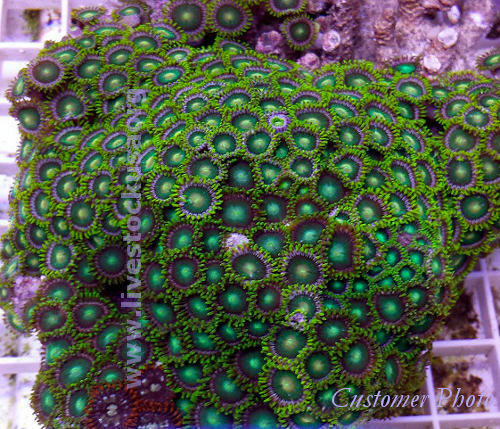 Check out these Fiji Acros that came in last week. These were a couple out of the box of a dozen larges. Thanks to Francisco M. of Miami for the great photos! One box of Fiji mixed non-Acropora corals with 10 pieces in it, 6 or 7 will be large or extra large size, very big pieces ... $600 special price for a limited time. Pick what you want in your box from the Fiji corals list, except for acropora, as they belong to a separate special. Send a list of 12 with 8 designated lg-xl&apos;s, so they can better fill your order. For a large mixed Acros only box they are 8 pieces per box, at $75 each for 8, so the same $600, but with 8 pieces. the Red Lobo and Pipe Organ are the sm-md size. If you want some big corals of the types Fiji has (see link to their list below), this is a great way and place to get them. Note Walt has two sizes, sm-med and lg-xl. The sm-med. Red Lobo and the Pipe Organ are still of very nice size. Some of the lg-xl sizes will be huge show pieces as you can see. With these roughly half of retail prices, we expect you to be willing to absorb one dead if that happens. Usually there are none. We thought this was interesting and wanted to share it with you ... look at this picture of a Kupang (Timor) Stylophora the day after arrival (on left), and in 30 days when it graduated from quarantine to display tank (on right). 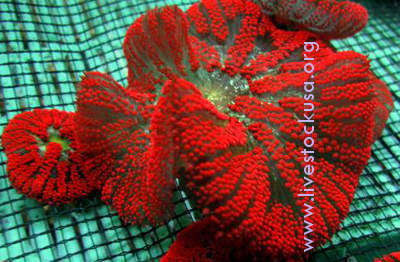 This photo is also featured on our new article that offers some tips on receiving tranship corals. Live Rock Update ... the 2014 CITES permits are about to be issued soon, but until then live rock and many corals are being held up awaiting the new permits. This situation is supposed to break at any time, and some corals are still available each week. Fiji corals are unaffected by this situation and are very good as usual. Fish are also unaffected, save maybe seahorses. 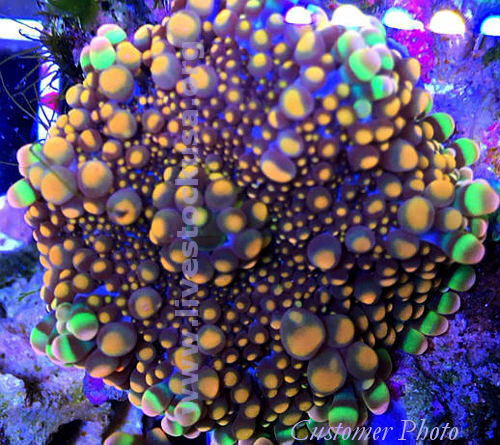 A couple of new photos have been added to the top of our Customer Photos page, two which include recent pics of Fiji corals. Just a reminder ... we have Excel files available free for the asking of current fish and coral supplies, as well as an acropora master list that has which species are available from which suppliers. Send us an e-mail if you would like to see this ... if you need .xls instead of .xlsx, just let us know. Hi all! ...and Happy Spring! This coming week (23rd) there are no Bali cultured corals for instance, but there is Kupang, Fiji, and Tonga (the latter two which are not Indo quadrant enforcement zone). So there is something available each week, but Indo supplies are tight. And ... yes! Tonga is back up and running for great wild Acropora and Montipora in particular, but no live rock. About a dozen corals to a box makes it the fewest piece box available. Ask us for their new list, although it is mostly the same. There has not been any live rock yet this year, or for the last couple of months last year for that matter. That is about to change ... the folks in Indonesia will be shipping very shortly, there have been issues with freight space and permits both. They&apos;ve had permits one week and no freight space, another week freight space and no permit, most weeks neither so far, but again, this is about to change. A shipment is cured in the vats and ready to go, with shipment supposedly to be imminent. We have some very exciting live rock news in that we now have some air-freighted Fiji available, of the Pukani flavor. Which is as close to "old-fashioned" Fiji as you can get. It is very porous, great shapes, lots of color and life on it, the real deal right stuff. We are taking orders for it now and it will start shipping next week. This will be shipped from Fiji with the weekly coral shipment, that&apos;s right, air-freighted! FRESH! There is also special order XXL available, which may take an extra week to get and which will entail a crate fee ($35), but they will get you a 2-3&apos; piece if you want. The regular boxes will be 60 lbs. with good sized pieces, the XXL will be heavier boxes of course. See our live rock page to see pictures or order some. Vanuatu is being worked on for live rock, permits are in-hand, air-freight logistics are the last hurdle to clear, and if that can be settled Vanuatu will reopen for live rock as well, should be shortly, maybe a couple of weeks. They are shipping fish again but no longer filling orders specifically. Three to four box assorted orders is it for now. Great for stores, but not for individuals. So the custom box order filled to specs is out for the time being. Bali fish are coming in great too now. Check out the lists at the Fish List Central page, or ask for the latest one, they have a very nice selection available. There are 1-2 dead in a box of a couple dozen fish, generally a wrasse or somesuch that is a known poor shipper. If you have any questions don't hesitate to holler at us on one of our toll-free lines, and remember, if you use Sprint in particular you may have to use our 855 number that rings to a cell. Send us an e-mail if you can&apos;t get through. We have been told by some Sprint customers that they hear a message that says our number doesn't exist via their Sprint service. As we have been told, this could be occurring due to Sprint and the local telephone company (for our landline) having issues regarding the connection fees, so Sprint gets cut off (then plays a tape to their customers that our number doesn't exist.) Far beyond not cool in my book. AT&T usually comes through fine. We're in a carrier war zone, awaiting your call! Fear not, spring is on the way! It has been a very cold winter for most of the country. For our packing, we have been using lots of newspaper and 5-6 heat packs per box and have shipped right through it with no problems. Before heat packs, the industry was built on newspaper for insulation, it is magic if the box is properly layered with it, plus it absorbs any leakage. We use the 40+ hour heat packs as well, saving 15-cents on the 20-hour ones is not a shipping risk we will take. For something new and different we now have a what-you-see-is-what-you-get (WYSIWYG) way of ordering custom coral boxes. These come directly from the exporters in Indonesia and Timor. 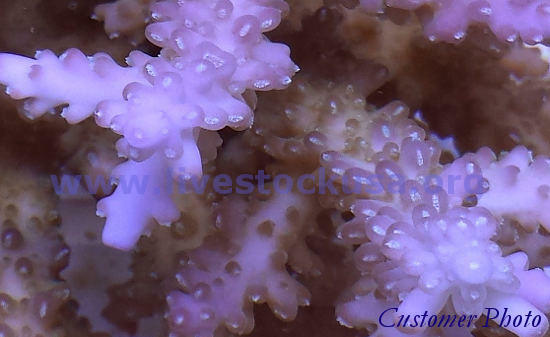 They are the suppliers we have long worked closely with that have the highest quality of corals. They are offering their best cherries in a new format now, making boxes of WYSIWYG corals available directly from the source. If you&apos;re looking for some real rare and fancy stuff, check these slide show videos out of Australia and the most mind-blowing Timor you ever saw! Timor is available on a WYSIWYG (what-you-see-is-what-you-get) or nearly so, basis every so often. This is how you get the cherries of the cherries. Here you will see acanthastrea, blastomussa, red zooanthids, and other radical stuff. Note - If photos appear pixelated, adjust the settings wheel on the bottom toolbar on the video screen, which is at the left side of the right hand group of icons, second from the left, to 480p or HD after you have started the slide show and it will correct the resolution setting. Check out our new &apos;tips&apos; article on hot water. We have some new assortments of aquacultured Nano Corals from Kupang and Bali ... giving you a choice now between three supply sources and mixed nano boxes! From Fiji, we have a 40-piece box of acropora, or mixed hard and soft corals; from Kupang we have an 80-piece box of acropora; and from Bali, we have a 36-piece box of acropora and SPS. Standard coral sizing is: Large, Medium, Small, Super Small. Super small is Nano. They are about 2" pieces. 80 pieces of assorted aquacultured Acropora, nano size. $10 each piece F.O.B. Kupang. It will be an assortment of the species and colors they farm, likely 20 or more different species in every color. Then add tranship cost of $300 per box for the international shipping, CITES, the U.S. F. & W. clearance, foreign box and packing charge, and re-ox at LAX. Total $1100, plus of course you pay the domestic shipping LAX to you to the airline when you pick up. You should have them at your door for $15 per piece, after and including your domestic freight. The Kupang cultured Acros are great, you just can't pick and have to take assorted. They know how to make a great assorted box. In 3-6 months they will be good sized smalls, in 6-12 months nice mediums, and a year on, larges. Their regular cultured Acro assortment box is 17 medium pieces at $45 ea., $765. They need a minimum of one week to put the nano order together. They ship almost every week, but orders placed on normal cutoff of Wednesday (Thursday at latest), will not come that next Sunday in three days, but the Sunday after that to LAX, in 10 days, and on Monday to you at your airport. We can also get a box of Nano Acros and SPS from one of our Bali suppliers, they are a little bigger so piece count is less, it is 36 Nano Acros (some Montis if you want) in a box. They are $13.50 each ($486), F.O.B. Bali. The various inbound tranship charges per box are international freight, Bali box and packing, clearance (Customs and Fish & Wildlife), and re-ox at LAX, again, $300 per box. Plus an Indo/Bali CITES permit fee of $1 per piece. Add domestic shipping LAX to your airport. So the box totals $822 or just under $23 per piece, and you can pick from their list of 25 or so Acros and Montis to fill your box. See the Bali-DNR nano list if you want to pick types instead of order mixed assorted. It is great stuff. Of course Fiji has their GREAT Nano box as well, 40 pieces, you can order it as an all Acro mix, all hard coral mix (which will be part Acros), or all soft coral mix, OR a two or three-way split, yes, you can have it your way. They are $18 each plus $20 Fiji box and packing and the $20 reox in LAX. Makes them $19 each leaving LA. Add domestic freight paid to airline when you pick up, and so $20 or $21 each to you at your airport. Fiji is usually a Tuesday at LAX, Wednesday to you. Though some weeks Thursday LAX, Friday to you. These are absolutely fantastic pieces, a great selection of everything Fiji cultures and has to offer. As Walt says, "tiny but nice!" short videos up that some of our favorite customers sent us. and we&apos;ll build a collection of them for all to see. explain your vid. Show us the fish, coral, or live rock you got from us. We'd love to see it! I'm sure others would too! coralline algaes, often some bit of macros too. thing now, unless you get in right before a shipment. Bali fish are coming in good from a couple of the suppliers. on it, from Bali to Kenya, Fiji, Philippines, and Red Sea. want other than .xlsx, say in dear old .xls format. are a little cheaper than picking species, with excellent 3"+ colonies. This great pick-your-species place has 3-4 to 5 inch colonies. bucks a piece higher from that supplier. They know what they have. It is stellar stuff, great health, color, and sized colonies. money-back guaranty, just e-mail us a request for the Acro-SPS master list. e-mail with any questions, any time. all of you a healthy and happy New Year! Lots of the country has been on the cold side lately. bubble-wrap can do wonders to retain heat in a tank. embargoes in a few spots as far as the airlines go. fish, coral, and live rock. mostly on who will spend CITES quota allowances on it. Either way the live rock will be great classic "Indo" rock. It is worth waiting for, as it is covered in life and color! on a wait and order way ahead of when you want it! Also, Fiji boat rock is available, but with a two box minimum. one. In stores, they'd go for at least double the price. way to view a variety of pages to see what is available. And, as always, you are welcome to send us an email! Best wishes for a great 2014!! guests arrive, you'll need to order soon! the airlines, we plan on shipping most of the month. to plan ahead as much as possible. weekend than the 21-22 weekend due to this. after Christmas, before the New Year. "They were picked up earlier and have been dipped and placed in the tank. There were two pieces DOA (out of 20). The ones that are alive are amazing already. Will make great additions - not possible to find such show pieces - especially at that price. Java or Bali cultured, Fiji, or Viet Nam! of the freight on the box for many of you. which may have Wednesday cutoff many weeks. Monti selections ... see coral list links below! Viet Nam&apos;s best of the best. about 40 mixed size fish. no fish, no corals, nuthin&apos;. Manado live rock is also currently off-line. is the real deal air-freighted island-to-you live rock. a couple weeks easy if you get in line mid-cycle. is only one source, demand exceeds supply. late October or early November. you are "in and counted," ... and then wait. live rock, expected into LAX sometime next week! get better until typhoon season hits. Just for fun ... this is one of Birdfish's favorite songs! Click on "Show More" at top of description to see lyrics. like to get some! This is really nice live rock! scheduled to arrive to LAX on Sept. 3rd. order now so you can make sure you are on the list! Viet Nam special boxes are coming in this week, order by Thursday. assorted mixes: 22 shrooms, or 20 zooanthids, or 25 soft corals. you is $600, plus a $20 re-ox fee (new bags, water, and ox). These boxes are a steal folks! Great pieces, coverage, and colors. ultra zoos and shrooms ... 24 pieces for $852. They are offering $50 off a box this week. page for some pix of these spectacular pieces. prices and the regular prices. it is $50-75 off, essentially a couple of free corals. the arrival date at LAX, Friday to destinations (YOU). and famous for a reason. season, so they will ship live rock now, but it won't last long is my guess. and there won't be any extra boxes like the good ol&apos; days. Manado will hopefully have a shipment available by the end of August. timing of fresh air-freighted live rock nowadays. is no telling when the next shipment will be. couple of weeks for a couple of months. and wait (for shipment) with a large dose of patience. like your house, doing it right is critical to success. you will quickly forget how long it took to get. There is word of an incoming Java live rock shipment! Java is where the long-famous Indo rock is from. It is very high quality, excellent live rock. shipment date yet), noting "Java live rock"
your phone number, or, send us an e-mail. with great coverage of coralline alga. Order ASAP if you want to get in on it. much notice when shipments get arranged now. of lists, we'll have the fish lists up shortly. as there won't be the normal transactions on Thursday. as it gets, and it looks pretty good. opening one of the boxes. Two boxes are $2.65 per pound and $265.00. Three boxes are $2.60 per pound and $390.00. sale pricing on Fiji, Banda, and Bali corals. pass it on to you in the way of a discount. of orders and their offers don't last forever. more fish (pending size) to make up your box. for them, as for anything brought in direct. persue for items you may be looking for. sized and they fill a box. send you the lists in spreadsheet format. proposed listing of some corals as endangered. You might find something interesting in one of them. kinda cool I think, whatever they are. and you&apos;ll be hearing from me again soon. :)"
Please e-mail or call us with your "want list"
button on the bottom of the page to order. average, big wild, full colonies. for only $575 ... a HUNDRED $$ off the regular price! box to your local airport! and shallow mixed for only $600. getting a couple free. This will almost pay your freight! These very special offers will expire soon!! FLORIDA BOXLOT SPECIALS: ONE WEEK ONLY! FedEx to your door, everything is included! and shipping via FedEx STANDARD OVERNIGHT to your door. Check out our new "Coral List Central" page. corals from many sources in one easy place. next shipment, which is hoped for by late May. to make sure you get in on the next shipment. shipment if it is already sold out. some corals only, no fish, no live rock, yet. ironing out of details to be done yet. supply of this best stuff. lists to choose types and often colors from. scarcer items on their lists. Banda is a new source and the corals are excellent. pick which 22 you want. Not valid with any other offer. pay your freight on the box. the major part of the doemstic freight LAX to you. export that species this week, etc., at any time. 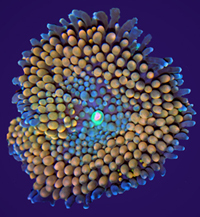 To see example photos, scan through our Acropora Page. To order, please go to our Ordering Acropora page, scrolling down to the Java ordering button. basic good corals. Live rock has been quite scarce and hard to get. One shipment so far this year of fresh air-freighted real deal live rock. Supposed to be more soon, the dam will break shortly. couple weeks to be shipped. said, and it will get back to normal consistency shortly. please send us a note for a special deal. Please see our new Banda Corals List. They have a great selection available from one place. 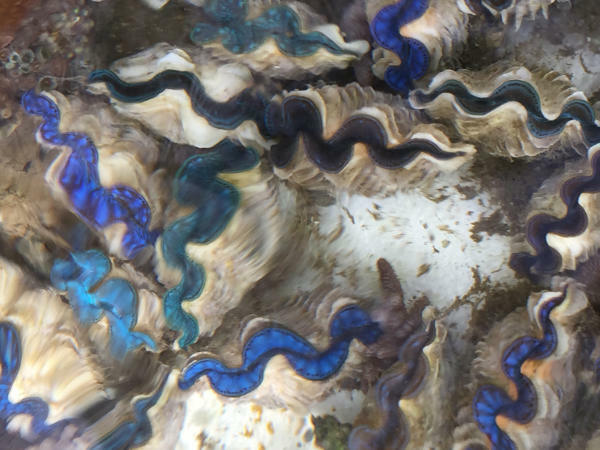 Keep an eye out, as we're making a "coral list central"
or to know what comes from where. some allow color choices for some species. Ask for the lists if you can't find the links. can take a couple weeks to get, but are well worth the wait. usually a dozen lately, the Fiji nano come 40 per box. The Fiji nano are called tiny, but they're extremely nice cultured frags. hard, and soft in the box, giving a great mix of all Fiji has to offer. At $18 each, $720 for 40 pieces it too is a great deal. (+ add $15 Fiji box charge). These may be ordered from our Corals Information Page. Here is a very, very special offer you won't see often. We invite you to take part in our Special Spring Sale. receive a $60.00 refund as soon as your payment clears. That is more than one free coral for every box ordered. unless you custom order super rare stuff, in which case you'll still get one free. Remember, you must place your order by April 30th. This special is for coral boxes only, not live rock. Viet Nam Super Fancy Zoos Box-lot. We hope you have enjoyed some of this "eye candy!" Word has it that Tonga will be re-opening shortly! could be sold out next week. We have a couple of updates for you. try to place a call and receive "dead air,"
especially if your call is being made from a cell phone. live rock and corals that have been shipped recently. customer comments from the last month. "Everything arrived safe and sound. Including some pics of this amazing LR! "I have to say these zoos are excellent quality. We can definitely do business with this supplier. softies. No deaths and very well packaged. All smelled fresh out of the bags. So happy with this shipment. "Thank you so much for such good service! On my order of live rock I'm highly impressed. for 2 more boxes of live rock." (rare) zoanthids and soft corals from Viet Nam. fanciest of the zoos from there, truly spectacular. leathers, zoos, a soft coral assortment. Please see our Box-lots page for more details! but some nice Acanthastrea frags to see if you like them. or re-open date in sight. if it is scheduled for the upcoming week. next week, so orders are best placed by Wednesday the 23rd. Stay dry and keep warm! it is expected to be coming in on January 22nd (to LAX) !! better than Thursday to be sure you're in! and is on for this Sunday the 20th at LAX. We wish all a healthy, happy, and prosperous New Year! until the permit is extended or a full permit is granted. a month, depending on a big wholesaler order. the wild, though the Tonga gives it a run for the money. Tonga besides great Acros has the best encrusting Montipora. can&apos;t do one fish two fish, one coral type of stuff. of the lower 48 states and Alaska, e.g., no international. the year-end close down of some sources and locations. not back up and running. you'd like a current list. the Tonga Red Branch and Fusion live rock is once again available!! Also, there is now cultured live rock available from Tonga. on the shape and type of pieces. get it half or half or with a third of each. The Fiji box has 40 pieces, the Tonga box is 50 pieces. you pay to the airline when you pickup. with a selection of Fiji or Tonga, these are ideal pieces. To order, see our Corals Information Page. The Fiji box is $720 (+box), the bigger Tonga box is $900. available as far as species mix goes. Tuesday to your nearest major airport. bags, water and ox. Quality is A-1, 5-star, outstanding. 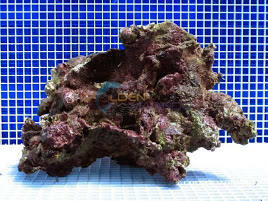 aqua-cultured TONGA live rock available! left there to export some aqua-cultured live rock. Yes, of course we are plugged in and can get it! but wanted to get the word out ASAP. It will be in 50 lb. boxes, $5.75 per pound. So $287.50 per box and shipped air freight from Tonga. but man made, artificial aqua-cultured live rock. MANADO live rock is coming Oct. 2, get your orders in! Thursday is cutoff, Wednesday is better. know what you want and put it together. Here's a great deal for the softie fans! couple of box-lots that might be of interest. Order by Thursday to receive Monday. Neon Green and Metallic Discosoma. green outside with red center, bright green. These are very nice rocks covered in beautiful zoos. Two or three of each type make the box. please send us an e-mail with your phone number. I just got all the rock into the tank and it's freakin unbelievable! P.S. Your information was spot on. Had no problem at all with the pickup ... thanks! It's always great to hear!! Don't miss our live rock sump sale! available fresh real deal 5-Star air-freighted live rock. know how soon at the moment. serve a purpose for some now. have to wait two weeks. worked for them on a second or third try! send an e-mail with your phone number. and the 50 piece Tonga box is $800. with lists from a dozen places on it! in hopes of this problem getting solved! Check out these pix of the last Manado live rock shipment. of various types, corallines, halimeda, etc. set firm, but that is the plan as of today. of this beautiful live rock. offering from our personal stash! !! Includes pieces from Tonga and the Marshall Islands !! long distance carriers, as described in our "Special Notice"
see on our Live Rock Photos & Pricing Page. "dead air" when they attempt to call. AT&T phone, their call is placed without any problem. long-distance carrier is Sprint or Verizon. phone number and we will call you. (Sprint and Verizon) landlines only. It is with great sadness we learned of the passing last week of Leroy Headlee, founder of Geothermal Aquaculture Resource Foundation (GARF). Leroy was a pioneer in the industry and had a truly great "wet thumb." Much of what is a major segment of the saltwater hobby today, fragging corals, owes a big share of its popularity to one of its orginal founding believers and promoters, Leroy Headlee. He was ahead of his time in many ways, and certainly he left us too soon as well. He didn't just know about keeping and fragging corals, he knew everything from major pond-keeping to breeding angelfish, he was the real deal aquatics man through and through that knew his stuff. He had a great way of making complex simple and that "bulletproof" article got a lot of people to take the leap into saltwater, by making them see they could do it. Leroy did the same thing with fragging. He got LOTS of people to do it, to try something they might have been afraid of. Nearly two decades ago (at least) he was cutting Acros, and he spread his knowledge freely, far and wide. The truth is, there were some industry people that felt he shouldn't be spreading these secrets. Leroy created another industry teaching others what he learned, and it has spread like wildfire. He had a great positive influence on many, that will be felt for some time to come. The new generation of fraggers might not realize how what they do in some ways can be traced back to Leroy Headlee's pioneering work to teach everyone how easy it is to keep marine, or how to frag stuff. Just as the books people read today are written by people that grew up on Axelrod, though today's newbie might not know who he was. He was a nice guy, a good man, funny, knew how to love life and live happy, and I'm sure will be greatly missed by many who knew him. Our heartfelt condolences go out to all of his friends, family, and especially to his dear wife, Sally Jo, whom was the light of Leroy's life. trouble with our toll-free number phone line! get through, please send us an e-mail. This problem is currently being fixed! We have some new articles on our Earth Day page. again, so it's not the 30-piece "monster box" that it's been. 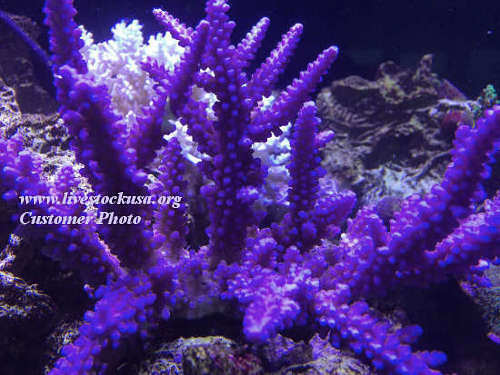 every two weeks, such as Java acropora. add us to your "like" list for future updates! We have now have Fiji air-freight live rock available on our Live Rock Photos & Pricing Page and you may place your order on our Ordering Live Rock Page. Some changes in availabilities are coming soon! The new CITES permits, as in every year recently, have severely restricted another few species and individual numbers. There is a new list of corals from Indonesia on our Hand-collected Hard & Soft Corals page. We will soon be offering tanked stock of fish and corals ... the lists will be up in about a week or so. You will be able to select from a current stock list and get shipments nearly any day of the week. And, if that's not enough, you aren't going to believe it, but Fiji air-freight live rock is once again available at a good price. It will be up on our Live Rock Photos & Pricing Page soon. 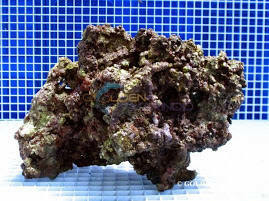 Many of the Indonesia area types of live rock are no longer available, as each piece is being counted as a coral against shipping quotas, so the exporters do not want to use their permitted allotment up on a piece of rock, instead of a coral. So, keep your eye on the webpage for these and other new things we will be bringing you this year. Happy New Year! We hope you had good holidays! We are working on re-doing lots of the pages on our website, so please bear with us as we work on it. There will be some new things coming very soon we think you'll like. Manado live rock is really coming in great, as is of course Vanuatu as always. The other types of live rock are currently off-line. We expect Vanuatu before the end of January, and the first Manado of the new year will be coming in on February 6th. The coral shippers are starting to get back up and on-line. The mixed boxes from Kupang, Timor are really great. $700 or $35 per piece for large whole colonies with a great assortment of twenty mixed corals ... hard corals, softs, shrooms, zoos, etc., the perfect tank stocker. These are the nice big $70-100 pieces in most stores and all will be the best colors and good size. Please see our Box-lot Specials page. We wish you a Merry Christmas and a Happy New Year, and we hope you have a GREAT Holiday Season! We'd like to thank all of our fans, supporters, customers, readers, we appreciate your stopping by, and patronage! Many of the sources overseas normally shut down for the holidays, and some already have done so. Fiji and Tonga are still shipping great wild Acropora colonies, and Tonga great encrusting Montipora. The best cultured Indo area Acros for the last six months plus are Kupang, 17 avg. pcs. per box, $45 each, $765 for the box, $800 if they put in 18 pieces ... these are better than Bali or Java and many different types come in the boxes, but no choices, just assorted, and you will be very happy. Most of the live rock is already done until the New Year with Vanuatu's final shipment for the year is most likely on the 18th. We will have some new exciting things to offer next year so keep an eye peeled and check back soon!